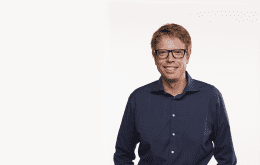 The National Science Foundation recently announced the award of a Small Business Innovation Research (SBIR) grant for $225,000 to Fortiphyte, a company founded by the IGI Entrepreneurial Fellow Alex Schultink. These funds will go towards identifying disease resistance traits to improve the productivity and sustainability of soybean cultivation. 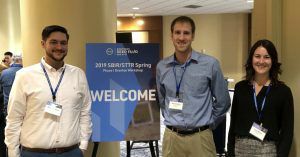 Fortiphyte founder Alex Schultink (center), scientist Nick Thomas (left) and UC Berkeley Haas School of Business student Erica Rhodin (right) recently traveled to the National Science Foundation SBIR grantee workshop in Washington DC. Fortiphyte was founded in 2017 as part of Schultink’s participation in the IGI Entrepreneurial Fellows Program. After doing initial work in tomato, which resulted in the development of a tomato variety with resistance to several major bacterial pathogens, Fortiphyte has expanded to address disease issues in soybean. Soybean is the most widely grown crop in the United States with nearly 90 million acres under cultivation. This ubiquitous legume is a core part of the food system and generates $22 billion in export revenue each year. Soybean pathogens reduce crop yields and are often controlled by the use of expensive and potentially hazardous chemical fungicides. By using their technology to develop disease-resistant soybean varieties, Fortiphyte plans to improve farmers’ profits while also helping the environment. “We’re very excited to have the support of the National Science Foundation to further develop our technology,” says Schultink. 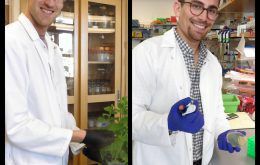 “Our approach uses natural traits to improve disease resistance, thereby reducing the need for fungicides and improving environmental sustainability.” Schultink used his time as an IGI Entrepreneurial Fellow to prepare moving his distinctive methodology from bench to market. Receiving the NSF SBIR grant is the next step in growing the company and applying their technology to soybean. 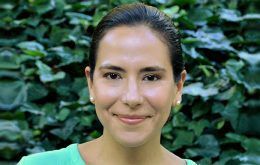 “The National Science Foundation supports startups and small businesses with the most innovative, cutting-edge ideas that have the potential to become great commercial successes and make huge societal impacts,” said Graciela Narcho, Acting Director of Division of Industrial Innovation and Partnerships at NSF. 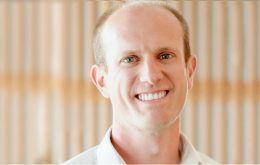 “We hope that seed funding will spark solutions to some of the most important challenges of our time across all areas of science and technology.” Fortiphyte’s mission aligns with the goals of the NSF, aiming to directly address an unmet agricultural need during a time when food demand continues to increase. 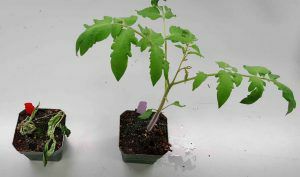 The bacterial pathogen Ralstonia solanacearum lives in the soil and can cause severe damage to susceptible tomato plants (left). Fortiphyte used their technology to develop a tomato variety with immunity to this disease (right). About the National Science Foundation’s Small Business Programs: America’s Seed Fund powered by NSF awards $200 million annually to startups and small businesses, transforming scientific discovery into products and services with commercial and societal impact. Startups working across almost all areas of science and technology can receive up to $1.5 million in non-dilutive funds to support research and development (R&D), helping de-risk technology for commercial success. America’s Seed Fund is congressionally mandated through the Small Business Innovation Research (SBIR) program. The NSF is an independent federal agency with a budget of about $8.1 billion that supports fundamental research and education across all fields of science and engineering.